Often used in complex stress problems, finite element methods are commonplace in many industries. 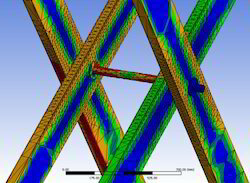 FEA is sometimes used in conjunction with structural analysis or stress analysis. Stress analysis can be applied extensively in a plethora of manufacturing scenarios where cost, material, weight, strength etc., need to be optimized or where safety factors need to be determined. Analysis is also a cost-effective alternative to experimental testing. Ensure the effectiveness of the design while accomplishing all of the above.